DASNY President & CEO Gerrard P. Bushell is reimagining the Authority’s business to streamline operations and put clients first. The 2016 Annual Report, released this summer, is no different. The Annual Report tells DASNY’s story through the eyes of its clients. The story unfolding in DASNY’s 72nd year is about the combining of public finance and construction into a powerful economic development force across New York State that delivers on the promise of government to broaden opportunity. It is this work achieved through DASNY’s partnerships with clients that have made DASNY the number one issuer of tax-exempt bonds in the nation and one of its biggest public builders. Science, Education, Health and Resiliency. DASNY is financing and constructing a rising science-focused industrial system in New York City. DASNY's issuing billions of dollars in low-cost bonds helps universities compete for top talent and hospitals save lives. The Authority is constructing havens for New York’s most vulnerable residents to find recovery and renewal. It is building for a sustainable and resilient future. These achievements are described through the lenses of DASNY’s clients in the Annual Report, making the connection between DASNY’s expertly delivered services and clients’ meeting their objectives. 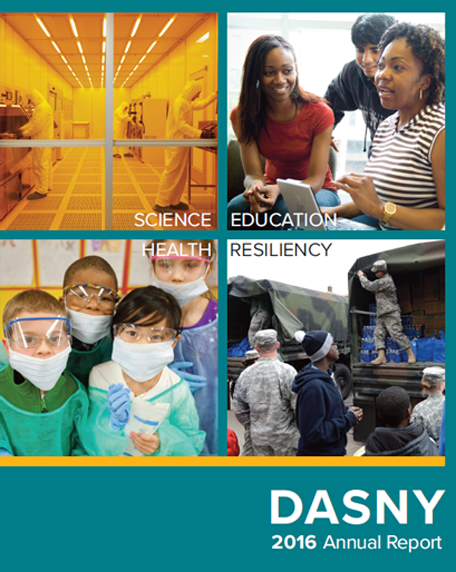 The report shows how DASNY is doing more for its clients, and how that leads to a stronger economic foundation and more work for minority, women and service-disabled veteran-owned businesses. DASNY was cited by The Bond Buyer and Reuters as having the highest number of low-cost, tax-exempt bond issuances in the nation through the first half of 2016. The $2.2 billion DASNY delivered to the market over 18 issuances provides savings to the Authority’s health and education clients. Those savings are helping New York State’s hospitals save lives, and its world-class education institutions strengthen their programming for students and draw the best educators. Through this work, DASNY and its clients are creating a sturdy economic foundation that makes New York thrive. Amanda Hansen, NY Rising Community Reconstruction Program Director. 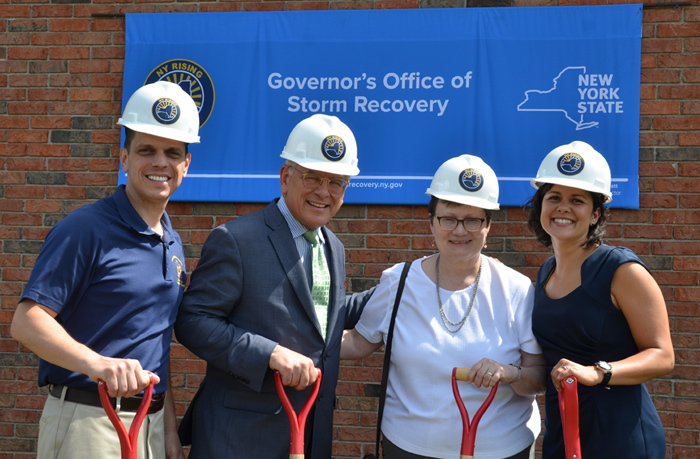 DASNY and the Governor’s Office of Storm Recovery (GOSR) broke ground in July on the installation of five emergency standby generators in the City and Town of Amsterdam, in upstate New York – one of the areas hardest-hit by flooding and storms in recent years. This $1.5 million project is part of the GOSR’s NY Rising Community Reconstruction Program and contributes to Governor Andrew Cuomo’s ongoing effort to builder stronger, resilient communities. DASNY engineers, architects and project managers are providing design and construction services for the Amsterdam project. It is one of approximately 60 projects valued at about $166 million that DASNY and GOSR are partnering on across New York State. Implementation of this project will provide emergency backup power for municipal buildings and school emergency shelters. The generators will be located at City Hall, Town Hall, the City Department of Public Works building, Amsterdam High School and Barkley Elementary School. Construction is expected to be completed by this December. Kimberly Hardy, Dep. Commissioner, NYC Dept. of Small Business Services. 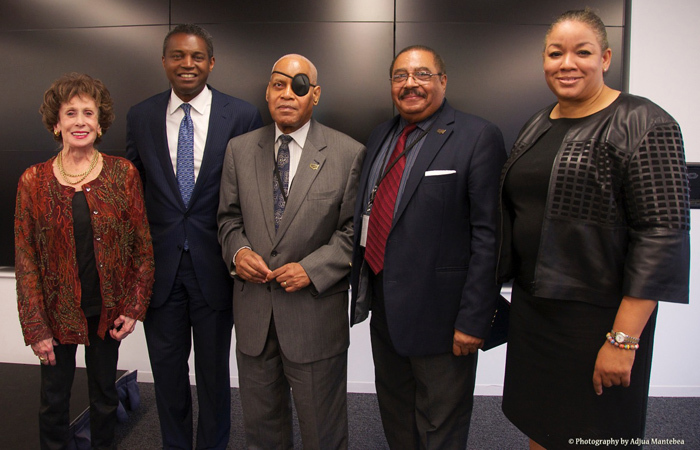 On July 28, DASNY President & CEO Gerrard P. Bushell delivered the keynote address at the National Minority Business Council’s 44th Anniversary Celebration Dinner. The Council has a deeply important mission: to expand opportunities available to small, minority and women business owners. It is a mission shared by DASNY.